You are here: HomenextTopicsnextLeisurenextCivic Hall Leeming Street? We went on a school trip in 1953 to see the Everest film – a change from the Coronation coverage of the same year. I can’t remember the name of the cinema / theatre or whatever it was at the time. I do recall the location however. It was roughly opposite the Palais De Danse on Leeming St. It could have been called the Civic Hall even in those days but I’m not certain. Excellent film by the way! I think this is a photo of the building, date not known. The Grand cinema is, or was, just around the corner. Hi Allan, thanks for that – I do believe we were at school together, I certainly remember your name well. I was at Newgate Lane, St.Johns, and Ravensdale in that order - I left Ravensdale at Christmas 1958. Trust you are keeping well! The theatre in your picture is the Civic Theatre (now the Palace Theatre). I too went with the school to see the film of the conquest of Everest and seem to remember it was shown at the Grand. Thanks Alan for that, you too remember “The Bowery Boys.” Another actor who did a lot of black and white films I remember and may have appeared at the “Tivoli ” in Woodus was William Bendix, yet another actor we lost at an early age in1964 at the age of 58. 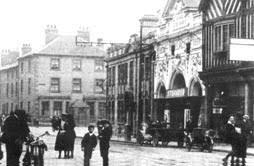 Hope we can see more comments about the “Tivoli” and the old Picture Places in Mansfield, of course buildings long gone but doesn’t nostalgia live on? The ” Bowery Boys ” . Early memories as a kid of being taken to the Palace, as yes it may have been what you would call the “Variety Theatre”. Remember me mother talking about an act called “Muscial Marie” playing a piano during the non stop show and maybe singing, also curtain came round when she had to go to you know were!, and still playing the piano!!!. By heck how took in were we as kids and parents too, and those days it was called entertainment, bring back Hopalong Cassidy and the five lads called something “——– Boys ” all before colour telly etc . Definitely shown there as mentioned, could have been a one off perhaps, the Everest and Coronation events were very close date wise as you will be aware. Interesting to hear a little bit of related stuff prior to ’53, thanks! I left school in 1952 and remember going to the Palace and it was a Variety Theatre. I remember the Hypnotists, Nudes[they weren’t allowed to move] all different acts that you would later see on TV. There was also an Opera turn which reinforced my love of Opera. I remember seeing Scott of the Antarctic about 1950 at the Granada when all the local schools attended. Was the Palace still able to show films as it had been a Variety theatre for a few years.